BLM Communications Jan 30, 2019. ANCHORAGE – Public Meetings are scheduled for the Draft Environmental Impact Statement (EIS) for the Coastal Plain Oil and Gas Leasing Program which the Bureau of Land Management (BLM) made available for public review and comment on December 21, 2018. Meeting times and locations will be updated on the BLM’s ePlanning Coastal Plain Oil and Gas Leasing Program EIS Meeting webpage as situations warrant. All public meetings will be open house style with a presentation and subject matter experts on hand to answer questions. Extended open houses in Anchorage, Fairbanks and Washington D.C. will accommodate larger audiences and varying schedules. In the remaining remote communities, a town hall-style meeting will follow for oral testimony to be taken. The publication of the Environmental Protection Agency’s Notice of Availability in the Federal Register on December 28, 2018, officially began the public comment period. The release of the Draft EIS is the next step in implementing the provisions in the Tax Act to establish and administer a competitive oil and gas program for the leasing, development, production, and transportation of oil and gas in and from the Coastal Plain area within the Arctic National Wildlife Refuge. 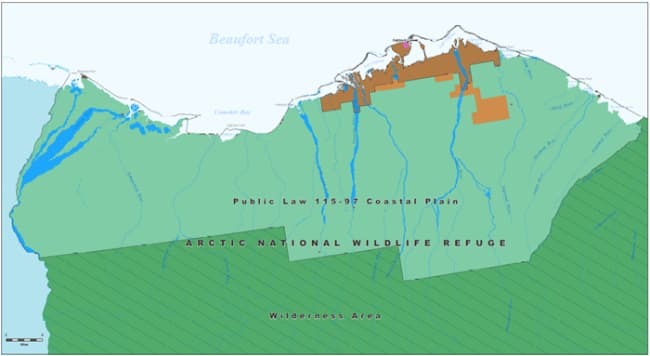 Congress specifically identified the Coastal Plain for its potential for oil and natural gas resources in Section 1002 of the Alaska National Interest Lands Conservation Act of 1980 (ANILCA). Oil and gas from the Coastal Plain is an important resource for meeting our nation’s energy demands and creating employment opportunities for Alaska’s North Slope residents. The first lease sale will be held after the Final EIS and Record of Decision are issued and will offer no fewer than 400,000 acres area-wide of high-potential lands for bid. The BLM is seeking feedback on the Draft EIS’s alternatives to inform the Final EIS and the Record of Decision. Substantive comments should include specific details regarding issues or concerns that also provide a rationale for the concern or suggestion. BLM Alaska State Office, BLM Alaska Public Information Center, 222 West 7th Avenue, Anchorage, Alaska 99513. Documents pertinent to this proposal may also be examined at the BLM Alaska Public Information Center.